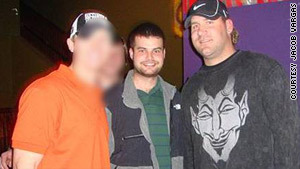 Ben Roethlisberger, right, is accused of sexually assaulting a woman at a Georgia nightspot Friday morning. (CNN) -- NFL quarterback Ben Roethlisberger is accused of sexually assaulting a woman at a rural Georgia nightspot early Friday, police said. Police talked to Roethlisberger, 28, and the 20-year-old woman at the scene immediately after the incident was reported at about 2:30 a.m. Friday morning at Capital City in Milledgeville, Georgia, said Deputy Police Chief Richard Malone. However, Malone said investigators still need to do a follow-up interview with Roethlisberger and witnesses. He added that nobody has been charged in the alleged incident and stopped short of calling the football player a suspect. He said the woman was part of a group mingling with Roethlisberger's friends at the restaurant and that the groups had gone to other bars and restaurants over the course of the evening. He said the woman was treated and released from a local hospital Friday morning. Roethlisberger's agent, Ryan Tollner, said his client would cooperate in the investigation. Roethlisberger has been the starting quarterback for the Pittsburgh Steelers for six seasons, guiding the team to two Super Bowl championships. "Last night, Ben and his friends met a group of women and everyone mingled together throughout the evening," Tollner said in a written statement Friday. "We have spoken to law enforcement. Based on information currently available, an allegation was made against Ben, which appeared to be dismissed after a preliminary investigation last night. "Obviously, given the prior accusation against Ben, we are skeptical of motive, but we will continue to cooperate with everyone involved." Tollner was referring to a civil complaint filed against Roethlisberger last year, also alleging sexual assault. Roethlisberger has denied the allegations by an executive casino host at Harrah's Lake Tahoe, saying, "I would never, ever force myself on a woman."